The perfect cuddly gift for to remind young children that God looks out for them and that they are special to Him. 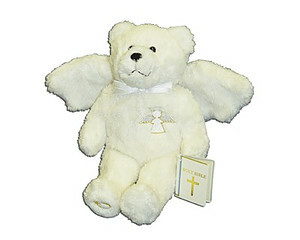 Guardian Angel Holy Bear was published by HolyBears in September 2003 and is our 7595th best seller. The ISBN for Guardian Angel Holy Bear is CAUGUAR9. Be the first to review Guardian Angel Holy Bear! Got a question? No problem! Just click here to ask us about Guardian Angel Holy Bear. Hi, I have seen a very similar bear on Amazon, on there it says taht the bear has an inside tag reading: "For He will command His angels concerning you to guard you in all your ways; Psalms 91:11". Does this bear have the same tag? Thank you. A:Yes, this bear does have said tag. Thank you for using the Q&A Forum.